PT Aneka Tambang (Persero) Tbk - ANTAM (IDX:ANTM, ASX:ATM) is a leading state-owned company in Indonesia, running business in mining industry. Headquartered in Jakarta, ANTAM concentrates its business activities in the field of integrated mining industry with main commodities are gold, silver, nickel, coal, alumina, and precious metals processing. PT Aneka Tambang (Persero) Tbk also running business in refinery services. Today, the Government of Indonesia is the majority shareholder at ANTAM, with 65% of ownership. Other 15% was owned by general public and investors. 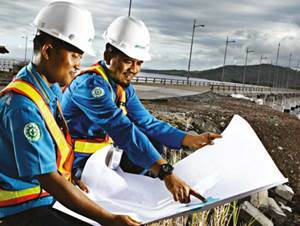 PT Aneka Tambang (Persero) Tbk now has 9 directly-owned subsidiaries, 12 indirect subsidiary companies, and 5 associates and joint venture companies. In term of financial performance, ANTAM posted total net sales of Rp 10,531.50 billion in the full year of 2015. This reflected an increase of 10% in total net sales from Rp 9,420.63 billion in the previous year. ANTAM’s gross profit was down 75.40% at Rp 195.14 billion from Rp 793.36 billion in 2014, according to PT Aneka Tambang (Persero) Tbk Annual Report 2015 as cited by JobsCDC.com. Not older than 35 years of age in 14 June 2016. At least 5 years of experience as Supervisor of Coal Fired Power Plant-CFB. Able to write daily operation report. Strong knowledge and skills of safety and job risk. Able to conduct safety talk. Possess certification in Operating License is preferred. Able to coordinate with other stakeholders. Demonstrated good command in English, both verbal and written with minimum TOEFL score of 500 or minimum TOEIC score of 600 (from reputable institute). Willing to be placed throughout Unit/Business Unit of PT ANTAM (Persero) Tbk. JobsCDC.com now available on android device. Download now on Google Play here. Please be aware of recruitment fraud. The entire stage of this selection process is free of charge. PT Aneka Tambang (Persero) Tbk - Coal Fired Power Plant SPV ANTAM June 2016 will never ask for fees or upfront payments for any purposes during the recruitment process such as transportation and accommodation.